A collaboration between car designers and loudspeaker engineers led to an optimum in-car audio experience. According to Stuart Nevill, a senior applications engineer at Bowers & Wilkins, the speakers in the XJ are of an infinite baffle design. That differs from the earlier XK model which, due to space restrictions, used one ported subwoofer in a sealed enclosure to enhance the bass from the system. In the XJ, Nevill said, the number of subwoofer drivers obviated the need for such a ported design, allowing the company to produce a cleaner sound. Creation of the bespoke speakers demanded that the Bowers & Wilkins engineering team took into account the form factor of the drivers, especially when designing the speakers for the doors. A compromise had to be met to produce drivers with profiles that would not only fit into the door well at a depth that was both shallow, yet deep enough, to provide the required movement of the voice coil. The use of co-axial speakers is an example of how the requirements of the car packaging and audio system quality were successfully balanced. Using co-axial speakers might have affected the sound, but by creating a novel mounting arrangement and redesigning the tweeter finger guard, the designers were able to enhance the quality of the sound from them instead. 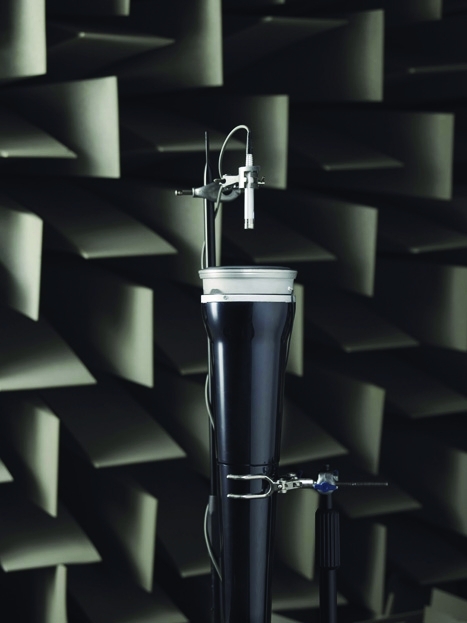 Once the engineers had developed prototypes of the loudspeaker drivers, they tested the system in an acoustic environment before deploying it in a test vehicle. The system was then tuned so that the car’s occupants would experience the same sound wherever they sat. The Bowers & Wilkins automated software optimisation process began with the use of automated software from Audyssey that captured the audio image produced by the speakers using microphones strategically placed in the car. The data collected was then used to automatically program a digital signal processor that controls the frequency response, phase, amplitude and timing for all the audio signals emanating from the loudspeakers, creating the optimum performance for every listener. Nevill said that the biggest challenge in designing the sound system in the Jaguar XJ was ensuring that the front passengers hear the surround sound behind them, and the rear passengers hear the front channel sound in front of them. Controlling the output from the drivers in such a fashion enabled any imperfections created by the cabin environment to be digitally corrected, and once achieved, provided a foundation for the engineers from Bowers & Wilkins to fine tune the system manually with individual audiophiles. The engineers also deployed Audyssey’s adaptive equalisation system to compensate for imperfections created in the cabin of the car when it is on the road. By using two in-built microphones in the cabin to measure low-frequency road noise, the digital signal processor in the car can compensate for it by lifting the bass frequencies of the system. The XJ audio system itself can be driven in three different modes by the radio, CD player or through a USB port into which MP3 players can be plugged. The entire system is controlled through an LCD touch-screen interface located in the dash of the car.